It seems a long way from Mid Wales, but for the last 21 seasons Val d'Isère has been home for Rupert Tildesley. 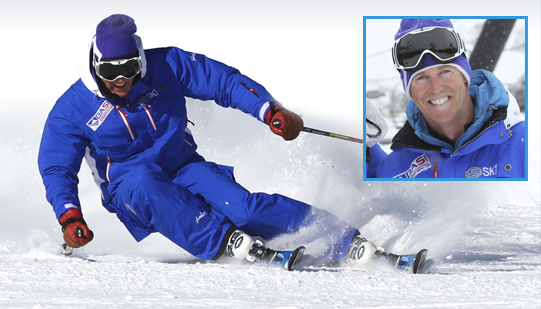 Qualified to the highest level in both the British and French systems, Rupert is one of the most experienced top level ski coaches in the world. He is a BASI Trainer and member of the British Demonstration ski Team and has represented Great Britain at the International Ski Instructors Congress (Interski) in Switzerland 2003, Korea 2007, Austria 2011 and Argentina 2015.The purpose of the congress is to raise the levels of Ski Instruction internationally and to share teaching methods across the globe. He has recently been involved with the rewriting of the BASI Technical Manual, drawing on considerable experience and technical knowledge of the sport. Outside of skiing, Rupert is a keen kitesurfer and skiff sailor. He competed in the 49er World Championships in Lake Garda in July 2009, races in this Olympic class double-hander on the ISAF World Cup Tour and was the first person to complete a land to land crossing of the Irish Sea by kitesurf (c.f www.thecrossing.org.uk).